One option that continually plagues the human existence is its opportunity to quit. There are a million quotes that discuss how easy quitting is and how addictive it can become. When you quit once, it becomes easier and easier to do it again — to just stop what you’re doing and walk away. Sure, when times get tough and business isn’t going your way, quitting comes to mind. You’re human, so it’s normal for quitting to be one of the your first ideas. But it’s what you do once that single defeated thought arrives that separates you from the pack. If you think that thought never came to Mike Stevens and Dave Engbers, you’d be crazy. The two men that launched Founders Brewing in Grand Rapids, Michigan in 1997 weren’t successful right off the bat. Although their beers were being enjoyed at every beer festival they attended, they still weren’t financially successful. They struggled and felt the true difficulty in operating a business. But where they could have felt fear and quit, they kept their heads down, stayed focused and remained dedicated to becoming Founders. Arriving at Founders Brewing Company in early May was unique. At the time parking was a hassle due to the $40 million expansion that’s been occurring. Streets were closed and it took a few turns to finally find the parking lot. You can immediately feel the enjoyment people possess that work at a brewery. Even the construction workers on site were in a joyful mood and more than willing to provide directions to the front office. Walking in the doors of the front office of Founders Brewing, you already know you’re walking into a well-established office environment. Above the Founders Brewing logo behind the front desk is the key phrase that’s echoed from the lips of Stevens and Engbers throughout the interview. The words that were chiseled as a mantra after years and years of struggle. 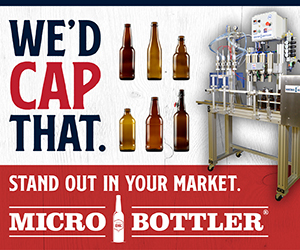 These words, “brewed for us,” aren’t a marketing ploy to inspire employees or the long-time Founders consumers. Rather, they were three words used to help focus Stevens and Engbers on the future of the company, and how to achieve their goals. In reality, it easily took 10 years for Stevens and Engbers to find their business acumen. Not to say they weren’t good at business early on, but it took nearly a decade to finally turn a profit and showcase the success of their drive and determination. The frustration came with the delays in construction of the original Founders. 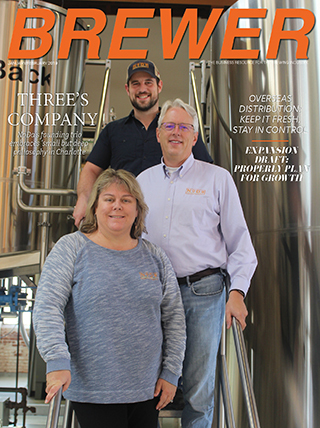 In which case, they missed the opportunity to become the second craft brewery in Michigan as others opened and took that credit out from underneath the two owners. According to Stevens, once Founders Brewing started making a profit in 2008, it grew an estimated 100 percent. “As we always talk about, we’re an affordable luxury,” said Engbers. 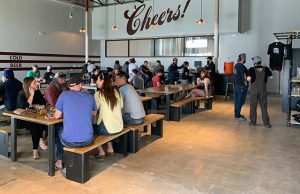 “But more than that, we had all this pent up demand for our product, but it was also the year that we opened up this facility and our tap room, which probably tripled in size from our original facility. Another aspect that really changed Founders around 2008 was the passion, “brewed for us.” Stevens and Engbers collectively decided they wouldn’t focus on following so many trends anymore. They wanted to develop beer that they enjoyed drinking. It was their belief that this would assist in the growth of the company. “The first couple of years we kind of struggled finding our sweet spot,” said Stevens. “We were trying to make the same beers everybody else was making and we realized after the first three years that wasn’t going to work. That’s when we were kind of flirting with bankruptcy and having to reinvent ourselves. Founders Brewing was doing whatever it could just to make ends meet. They even sold the filter in order to make payroll, which was just the brewer, but he had to get paid. The sell of the filter ended up sticking with the company and causing the new location to brew non-filtered. 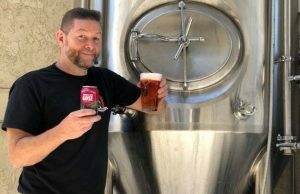 “People think we’re non-filtered because of some stroke of genius, but the reality is, we couldn’t pay our bills so we sold our filter and it forced us to figure out a process that allowed us still to produce clear beer,” said Stevens. 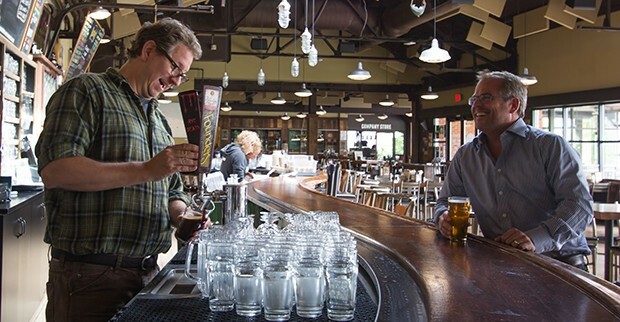 Now Founders Brewing can afford a filter, but it has become part of the brand. “It’s what makes our beer taste like it does,” explained Stevens. 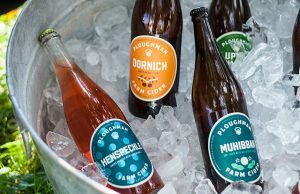 While everything was good on the beer front, as it’s been repeated multiple times, business and growth weren’t always easy. However, it’s the difficulties that come with starting a business that help a lot of great entrepreneurs, Stevens and Engbers included, to become great down the road. It’s been this practice that has helped Founders Brewing to develop sub brands like the All Day IPA, Breakfast Stout and many others. It’s been Sevens’ and Engber’s passion towards developing beers that they’d like to drink, as opposed to following the brewing trends. All Day IPA is in fact the biggest showcase of the entire story: a beer that was founded by the founders of Founders from the desire to have a sessionable IPA before sessionable was trending, that would allow them to enjoy the hoppy flavors and aromas all day. Next Story → What’s Your Brewery’s Growth Strategy? As a fellow, though novice, beer writer. I loved the phrase ‘founded by the founders of Founders’. Good article. I felt like I got to know the founders.